This Moroccan Koumaya dagger is a fine exemplar, 20C. vintage. Very well forged blade 9 inches long. Rhino horn grip with silver mounts, with the pommel stamped and dated 1390 ( 1970 in the Gregorian calendar). 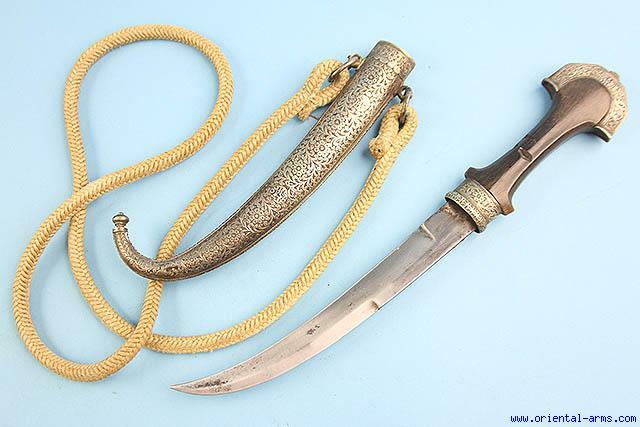 Heavy silver scabbard finely chased and engraved with Arabic inscription. Original baldric carrying rope. Fine condition. Few bug bites on the grip.